As Andrew Levermore, CEO, HyperCity Retail, says, “Rich people love low prices, the poor need them.” As planned spatial function and dynamics of social institution is rapidly changing which leads to changes in tendencies of market thus transforming the marketing system and introducing the concept of HYPERMARKET. A hypermarket is a retail store that is a combination of grocery supermarket and departmental store. For example: Wal-Mart Super centre, Reliance, Big Bazaar etc where consumer is provided with an enormous retail facility with full line of groceries and general merchandise. People were overwhelmed with the choices available at hyper market which made it a big hit all over the country. Hypermarket retail industry was considered more vivacious than ever because of the industrialisation, macroeconomic performance of the country and need of organised retail segment. Due to modernisation and technological growth there was growth in personal disposable income in the last 15 years which made it necessary to have giant retail story where everything is easily accessible. Best part that attracted lot of customers were less prices of hypermarket as they tried to sell product at less margin thus making consumers addicted. Big retail store had advantage of selling high volumes of merchandise, therefore they had greater purchasing power as compared to small retailers which in turn apply pressure on vendors, potentially securing discount on goods that their rivals cannot get from the vendors. This allow the hypermarkets company to sell merchandise at lower than its competitor. Hypermarket was giant, fully AC and completely organised which became the reason as a day out place for people. Similarly, to beef up the margins, hypermarkets in India continuously strived to bring down the share of branded products, substituting them with the store brands like MORE stores have their own brand breads and pulses in their stores. No category was left unexplored. In India people are highly dependent on kiranas shop near their place that provide good discount and have cordial and personal relation with each customer. They even provide the facility of home delivery. These are the internal and external factors that are also the challenges faced by hypermarket in India. 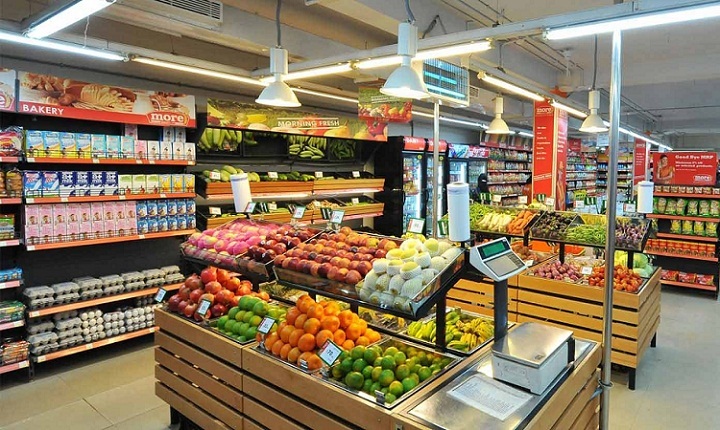 It is predicted by market researchers that in the near buy future hypermarkets will be replaced by blend of online and offline shopping that is people will be depending upon online sites like grofers for their grocery shopping as people are growing accustomed to the benefits of digital in other retail setting. Online shopping will reduce the inconvenience of walking down to hypermarkets and would have better discounts and leverages. Offline people will rely on kiranas.